This year, we have over 1,500 pieces of high quality tosai from Dainichi, Isa, Ogata Ooya, Omosako, Maruyama, Momotaro, Nogami, and Sakuma koi farms. 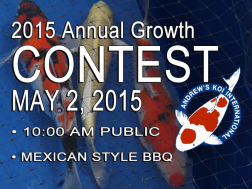 They are sized between 6” – 10” and priced at $100.00 each; these koi can be entered in next year’s contest. All contestants with nametags can begin to select koi from 8:00 a.m. -10:00 a.m. We will open the gates to the public at 10:00 a.m. Show tanks are limited, so please call to reserve a tank and let us know how many koi you plan on entering into the show. When catching the koi, each contestant must not have more than 3 koi per bowl per tank so that others may have a fair chance to select koi. Please be gentle to the living jewels. We hope you enjoy our Growing Contest!